Well, this is a strange year. Who would have thought I would come out of a DCEU film, that I had no intentions of even watching, with a positive opinion. It was such a strange experience. The reason being I am a big fan of DC comics and their graphic novels. I have read so many of them. So I would usually go into one of the DCEU films with hope that it would give me the same joy I get from their comic books. For example, I actually love the character of Aquaman in the comic books, and Manta is one of my favorite villains. Going into this year’s Aquaman, I hoped to get something substantial. What I left with was one of the worst film experiences in a very long time. But with Shazam, I don’t even like the character from the comic book side of things. I never really connected with him so I didn’t give his comics a chance. That’s why I entered this film with zero expectation, bordering on negative expectations. I knew I would be disappointed, nothing else proved otherwise. So you would understand my confusion after I left the cinema with a smile on my face thinking “Huh, I enjoyed that”. And that’s exactly what happened, I enjoyed it. I used to always say I wanted DC to avoid copying Marvel’s formula of this balance between a big budget action film and a cheesy comedy. I didn’t want that, I always knew I wanted something different. But Shazam proved me wrong. The film’s greatest strength is that it doesn’t take itself seriously, however not in a bad way. Within the context of the film, for some reason everything works. Even when certain elements are over the top and cheesy, within the world of Shazam it makes total sense. The best way I can describe how this film feels is this. You know those films you used to watch over and over again when you were young. Those simple blockbuster movies that are lighthearted, fun, and just make you want to laugh and smile. That’s what Shazam feels like to me. It feels like a film I used to enjoy as a young boy and still find nostalgia whenever I turn it on regardless of the flaws that I am able to see as an adult. Sometimes you don’t really have to be serious and gritty. Sometimes you just want to have fun. Shazam has fun, that’s what I like about it, and I don’t want it to change. In all seriousness, I actually think the strongest element of Shazam and my personal favorite is the meta superhero element of the film. Shazam shows you the story of what a kid would ACTUALLY do if he suddenly got superpowers. He won’t suddenly feel brave and have this urge to save the world. No, he would rather make a Youtube channel goofing around with his powers. Maybe go buy some beer, rob an ATM, charge people’s phone with a zap, or just walk around taking selfies with people. 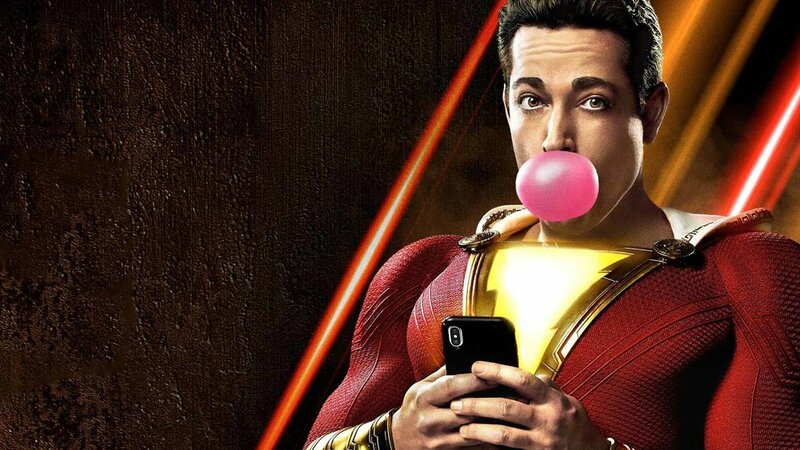 Shazam broke the rules of superhero films, it lifted the veil off of this unreachable world that we would not be able to connect with and showed us how discovering superpowers would actually feel like. I mean Deadpool kind of does this, but in the way that Shazam does, it feels more genuine for some reason. Especially when it breaks certain Hollywood tropes, like when Dr. Thaddeus was giving his epic speech but Billy wasn’t able to hear anything due to how far away they were. All of these scenes in which the film “broke” the rules of traditional Hollywood blockbusters really made me smile, and it’s what I will come back to if I ever want to watch the movie again. Along with Jack Grazer’s performance of course, he honestly kills it and I think we are looking at a future blockbuster star. Obviously the film isn’t without its faults. Far from it. Shazam actually had many missteps that I would have been more critical of, if it were not for the mere fact of the tone the film. The way the film doesn’t take itself seriously for some reason excuses many of the flaws and paints it over with what they want you to focus on. But they are still present, like the horrible CGI of the demons. Remember when I said that Shazam reminded me of a film from my youth, well the CGI is really helping with that theory because it feels really dated. I also wasn’t all that pleased with the villain, he was pretty bland. Having another “I’m evil just because I’m evil” character is dull, but thankfully he was not overbearing. The overall action scenes were pretty weak as well, but again, it didn’t last long. Shazam definitely has many flaws. It doesn’t do anything new. It will likely not push the genre of superhero movies forward in any meaningful way. And it certainly won’t be enough to remove the stigma of DCEU movies. What it does have is an enjoyable experience. Yes it is sometimes cheesy and over the top, but for some reason it just works. Go into this film with no expectations. Take your kids, or your younger siblings and just enjoy your time and let loose. Even though my favorite films are always indie art films that push cinema forward as an art form. I never deny the joys of laying back and just enjoying your time with a mindless blockbuster that will make you laugh and put a smile on your face as you are walking out the theater.